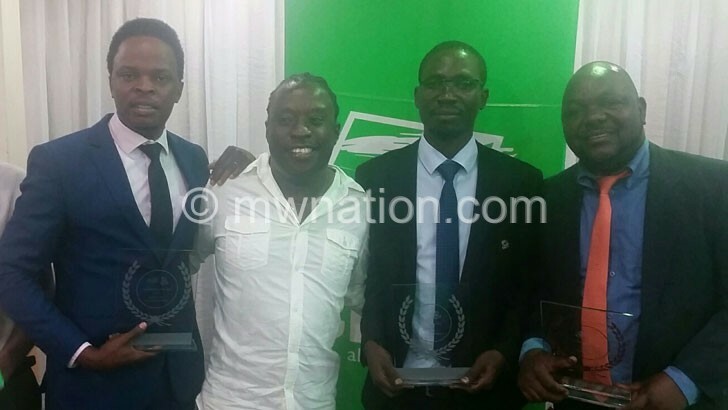 Nation Publications Limited (NPL) sports desk on Saturday won three of the seven trophies during the TNM Super League Media Awards at Sunbird Mount Soche in Blantyre. The winning of best print journalist, best photo-journalist and best online journalist awards by Joy Ndovi, Bobby Kabango and Pledge Jali, respectively, means NPL has swept all the available trophies in tandem with the company’s line of business. The development also shows that Ndovi and Kabango have reclaimed the TNM accolades and that NPL sports desk has scooped all, but one of the football awards they contested for in the 2018 season as Solomon Manda was recently named best print journalist in the Chitetezo Mbaula Southern Region Football Association (SRFA) League. On Saturday, Peter Fote of Mibawa Television was named the best television journalist while Capital FM’s McFaren Mbewe emerged the best in radio journalism. Snowden Kadzakumanja of Rainbow Television scooped the best television camera accolade while Williams Gondwa of Times Radio did it in the commentary category. Each category winner received a K200 000 cheque, a trophy and a TNM products hamper. FD Communications facilitated the awards. Unlike in the past, an independent panel of judges comprising media studies lecturers at the University of Malawi’s (Unima) The Polytechnic—Ellard Manjawira and Maclan Kanyang’wa and Centre for Solutions Journalism executive director Brian Ligomeka—assessed the entries to identify the winners. “For the first time, TNM used independent judges but still we have defended the awards,” Ndovi said. NPL sports editor Garry Chirwa said the success speaks volumes about the level of professionalism that the sports desk emphasises in its operations. “We strive on excellence and it is all about team work at NPL,” he said. Manjawira, who was the chief judge, said it was not easy to come up with winners due to stiff competition in each category. “We did not look at the quantity and patronage of published or broadcast works of individuals to come up with the winners, but we used the scoring matrix that dwelled much on quality analysis of the 2018 Super League,” he said. Super League of Malawi (Sulom) treasurer Tiya Somba Banda said it is great that the awards for journalists have for the first time been separated from the players awards to be in line with the international standards.